Aberdeen manager Derek McInnes regretted that his team could not extend their interest in the Scottish Premiership title for another week. Their at Tannadice meant Celtic were confirmed as champions for a fourth consecutive season and takes the edge off Celtic's trip to Pittodrie next Sunday. "We are disappointed, naturally," McInnes told BBC Scotland. "We have pushed a strong team with huge resources all the way but we congratulate Celtic all the same. 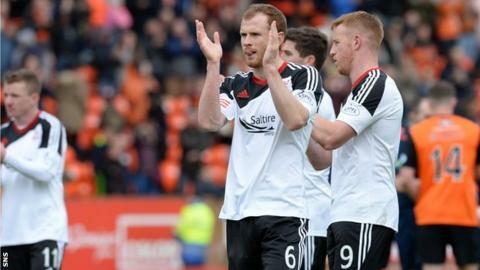 "Before I took charge a couple of seasons ago I came to watch Dundee United against Aberdeen. It was a game to get into the top six. "Two years on we are trying to take the championship to three games to go and we bring a crowd here full of expectation. "The players have put so much into it. We are lucky to have them and we are lucky to have the support. "Days like today can only help us be successful going forward. The aim is always to improve. "I've no reason to think anything other than we can be successful next season." Robbie Muirhead struck on 13 minutes for United and McInnes admitted his team struggled to recover. He said: "Once they got the lead they showed what it meant to them to get a result. "It felt like a cup tie. We knew the consequences; we wanted to win the game and we did have a right good go at it. "Probably the nature of the game affected some of our performances. We were a bit loose in possession, but we gave everything. "The punters came here in big numbers and made the game. It was a crackling atmosphere and I am sorry not to get the result we came here for. "I thought we had good opportunities to score but it wasn't to be." United manager Jackie McNamara described his players as "outstanding" as they moved above St Johnstone into fourth place, with Inverness four points clear of them in third position. He said: "We put our bodies on the line. Aberdeen put us under pressure and we blocked the shots. I'd like to have got a second goal to calm everything down. "It was a fantastic game. You have to give Aberdeen credit for how they have pushed Celtic. They possess a lot of threats and I thought we handled them well. "It's a massive three points for us and it's still there for us to chase third spot. "I was pleased with the clean sheet. That's two more than last season and we've equalled the number of wins of last season. Despite all the negativity, we are still progressing. "That's four teenagers starting and another two coming on. The best way to get experience is to play. They have the ability. Sometimes at this level it's just the physical strength. You can see how good they are on the ball." On match-winner Muirhead, who United signed from Kilmarnock in February, the Terrors boss said: "That's why we brought him here. "That's two starts he's had now and one goal. He's going to be a fantastic player for us."